Hurricane Sandy has wrecked havoc along the Northeast, to the extent that she is known as the largest Atlantic Hurricane on record. The storm caused the deaths of at least eleven people and resulted in power outages and destroyed homes. This kind of chaos is serious, but recently, the story of a model, Hurricane Sandy, and an inappropriately timed photo shoot has become predominant in the news. The model’s name is Nana Gouvea, and she decided to pose with the wreckage of Hurricane Sandy in the backdrop: broken cars, fallen trees, and a stormy sky. Gouvea looks at the camera in a variety of sexily charged positions without apology. The model, whose husband snapped the shots, reportedly likes storms because they give her time to spend with her husband. Her weak excuse for her love of storms, however, has caused instant backlash. The model poses in all her glory. Photo courtesy of http://www.huffingtonpost.com. And understandably so. Many people have called out Gouvea on her lack of sensitivity to the victims of the Hurricane Sandy, as people have lost their lives and their homes. Dissenters of the overwhelmingly negative reactions to the photographs seem to maintain the following mantra: she isn’t hurting anyone, so what’s the big deal? The big deal can be broken down into two main reasons. The first, and most important, is that these photographs represent how desensitized people can become to tragedy. The ability to empathize with others, to feel deeply for someone else’s plight, makes us human. What Gouvea shows, however, is monstrosity. Whether or not she was aware of the implications of her photo shoot at the time, she is essentially re-appropriating an event, a setting of brokenness and loss, so that it becomes a setting for “looking good.” This supreme selfishness and lack of empathy makes the photo shoot monstrous and her actions less than human. 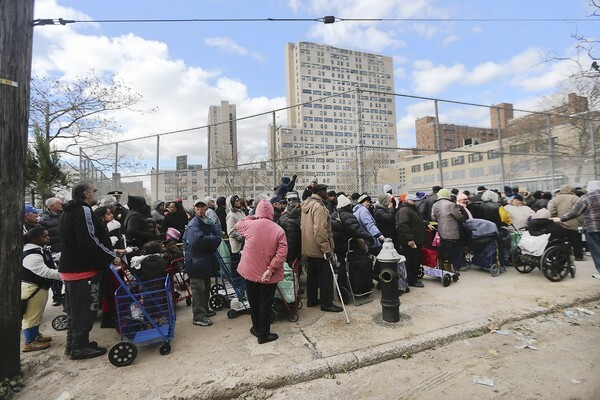 Those affected by Hurricane Sandy wait in line to collect water and food from a center on Coney Island. Photo courtesy of http://blog.zap2it.com. Secondly, the “big deal” about Gouvea’s photo shoot is the light that in which it portrays the fashion industry. While this was not a photo-shoot done by any professional photographer or created for a magazine, its medium is associated with fashion. Additionally, many newspapers categorized articles concerning the incident as fashion stories. 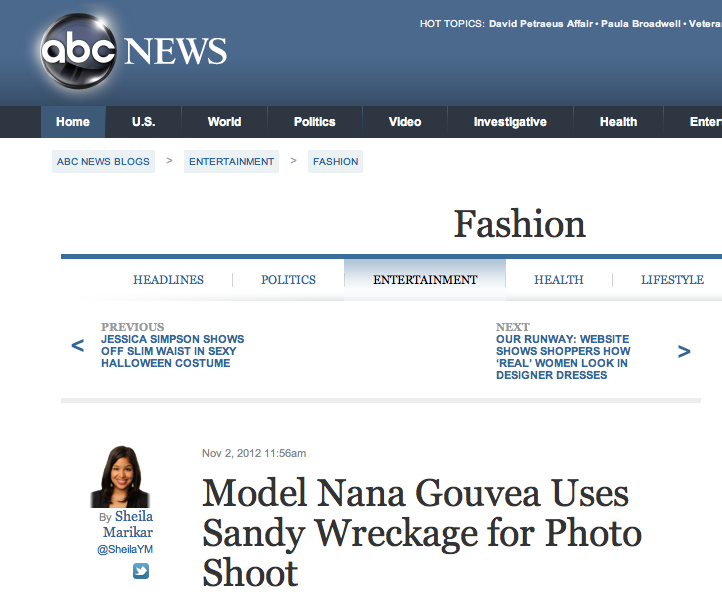 For example, ABC News’ story on Gouvea, “Model Nana Gouvea Uses Sandy Wreckage for Photo Shoot,” was placed under their “Fashion” headline. In light of the negativity that the industry usually generates, this kind of attention is unwanted. Many people view the fashion industry as frivolous, expensive, and almost insular from the rest of the world. And Gouvea’s photographs exemplify this attitude that the fashion industry does not want and frankly cannot afford. A screen shot of the ABC News story on Gouvea. Photo courtesy of http://abcnews.go.com. Our fall issue is wrapping up (expect it before fall break! ), so here are a few pictures from Uniquities and Martin & Mary’s that didn’t make it into the magazine – get excited! Yesterday’s shoot was for the upcoming fall fashion spread, Stylist’s Choice, showcasing 6 hot items our stylists are loving for fall. One of our picks was a pair of vintage turquoise acid-wash jeans. Pairing them with a men’s over-sized tuxedo shirt and funky sneaks, all of the stylists (including myself) just went ga-ga over this throwback 80’s trend. What do you think? Should this look be restricted to Saved by the Bell re-runs, or should they make a comeback for fall ’09? Creative professionals destructing adventurous and provocative scenes of innovative fashion to produce tantalizingly fresh works of art. These words sum up just a minuscule portion of statements that could be used to describe FashionServed.com. The site showcases both original portfolios of professional photographers as well as the fashion collections of numerous top designers. Giuliano Bekor created prints for the Eva Culture look book capturing the elegance of the beautifully draped clothing while pushing for a strong sense of romance through the model’s poses and dramatic hair. Humor also plays a role in some of the more editorial shoots. I could not get over the ridiculous makeup and setup of Ben Duarte’s Circus Life editorial featuring models in a strange array of prints and shapes with full on clown makeup. What exactly is remotely pretty or interesting about girls in straw with a circus tent as a background? Maybe others think differently but honestly, clowns are scary! FashionServed.com definitely can take the viewer by surprise but its power to do so makes the up-and-coming site worthwhile to check out. I’ll end with a quote from Lady GaGa. It goes out to all my friends with a similar fetish for beautiful clothing WAYYY above our price line. The Kaleidoscope stylists had the photo shoot for the summer issue last week. Check out some pictures on our site!